Would you like to learn how to play many songs – not just the one you have the sheet music for? Would you like to be able to play Rock, Pop, Blues, Funk, Soul and Jazz? Well – there are simple formulas for that, and all of them are based on CHORDS. Playing Piano with Chords will teach you the necessary tools to understand and apply COOL CHORDS IN MANY STYLES and IMPROVISE OVER THEM. Not only will you learn many tunes with audio and video examples, but you will also be guided step by step to CREATE YOUR OWN CHORD PROGRESSIONS and SONGS. No matter if you are a beginning or intermediate player, Playing Piano with Chords will let you play beautiful music right away and enrich your piano skills in many ways. Order now for only $37! What if you could master the basic ingredient of most music out there? Did you know that most rock and pop songs are built around just a few chords? That’s why learning chords in the right combination can unlock so much music for you! In this book you will learn the necessary chords and chord progressions to get you started in pop, rock, blues, funk, neo soul and jazz. 100+ audio files and professional backing tracks will give let you listen to every example and tune that you will learn. 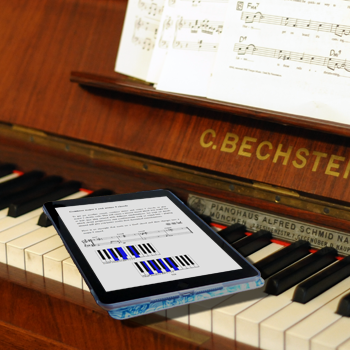 80+ minutes of video content with a virtual keyboard and the sheet music played back in real time will help you find the right keys whilst you read the sheet music. Not only will you learn how to play different music styles on the piano, but you will also learn how to create your very own tunes. 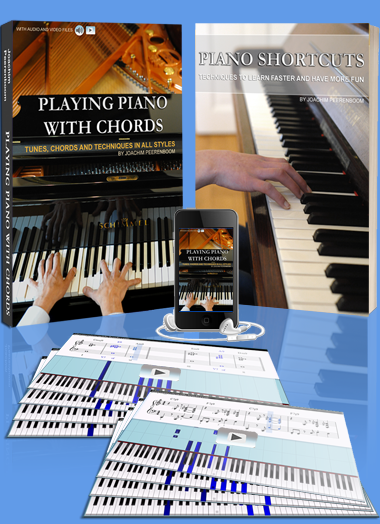 Chord charts will help you learn the chords, scales and musical examples in the book. 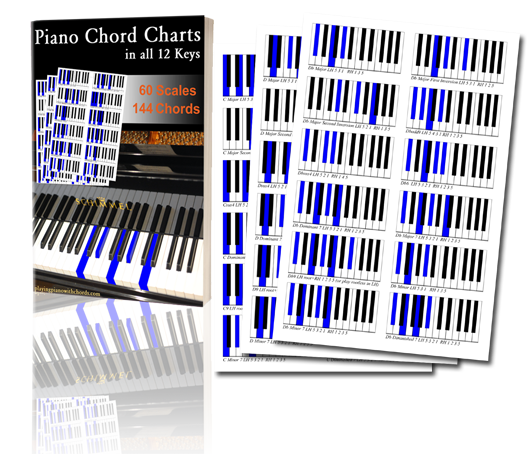 Using the chord charts you will learn to play songs without needing sheet music. Speed up your learning and make your precious practice time more efficient. Use tested techniques to learn faster. Forget dreary piano lessons and start learning the piano with a new range of music, in your style. Discover how to enjoy your piano practice and customise it to your tastes. Get the bundle now for only $37! See for yourself what’s inside! You will be guided step by step to learn all building blocks for the featured song arrangements. 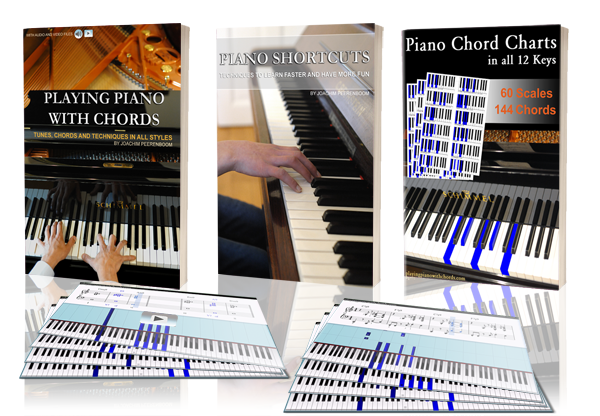 PLAYING PIANO WITH CHORDS will help you enrich your Piano Skills instantly! Learn Step by Step with Chord Charts for every new Chord! Beginners will start playing right away and learn simple chords to start with. playing and applying great sounding chords to play and create music. 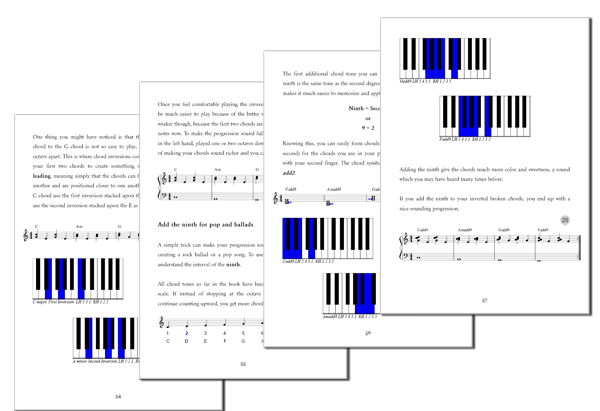 FREE COPY of PIANO CHORD CHARTS! All files will be available for instant download after the purchase. Note that some files are big and will need a while to download. You will need a free PDF reader such as the Adobe Acrobat Reader to open the .pdf files. Questions? Contact us via email! Why Wait? Buy Now And Start Playing! Why put off taking your piano skills to the next level? Forget dreary lessons and start learning the piano with a new range of music, in your style. ClickBank will allow for the return or replacement of any product within 60 days from the date of purchase. For more details see the ClickBank return policy. if you buy now. That’s just as much as you would pay for 2-3 piano lessons!